Harry is a frugal man living modestly in London when his father, the Duke of Sommerset, and and the heir, his brother Edward passed away in an accident on the family estate. Suddenly Harry finds himself the new Duke with an impossibly high debt and no way to pay it off. In order to gain some leverage, he hopes to marry his betrothed and collect her dowry. As a Malcolm, Christina has inherited a special magical talent: she can see and communicate with ghosts. Harry is the only man who doesn’t chastise her for her antics. And she cannot forget their stolen kiss in the gardens one night, long ago. However, she is utterly shocked that Harry not only wants to uphold the betrothal he made five years ago, but he wants to wed her immediately. Christina and Harry have been friends for years and she cannot understand why he has changed so much and has a blackened aura these days. Fearful she’s lost the “real” Harry – the only man she knows she can ever love, she agrees to marry him but gives him two weeks to court her and learn to love her (again) after the fact. In the early parts of This Magic Moment, we watch two characters who live their respective lives according to their own rules of what they feel is befitting of his/her station. As the new Duke, Harry has a sense of protectiveness and the need to take care of those around him. He is driven to save the estate, even though it appears mortgaged and impossible to keep without a large influx of funds. He realizes as the Duke, he can no longer afford petty disagreements nor fanciful ideas. The stress of holding it all together while maintaining the facade of calmness and trying to hide his financial state from Christina has made Harry a bit unfriendly and cold. On the other hand, Christina is a carefree spirit who feels that she can demand true love and happy endings. She is blind to what is happening around her–more interested in chasing the ghosts that inhabit the Sommerset manner. Because she senses darkness within Harry, she pushes and commands him to change his ways without taking stock of what is at the root of the problem. Due to the fact that the story is written from both Christina and Harry’s point-of-view, the reader is privy to the true nature of both characters. This is important and makes for a richer tale. Through Harry we realize his guilt for asking for Christina’s hand because of her dowry, and that although he doesn’t realize it, he does love Christina. Fortunately, the truth about the family estate’s financial problems comes out at about the halfway mark. I’m glad that the pretense did not carry on throughout the entire story. Harry’s brutal honesty (I married you for your money) was harsh, but once the truth was revealed, things could only get better. This is when Christina really came through. I was extremely glad that she was wise enough to realize the truth in Harry’s heart rather than complain and lament “woe is me.” Her self-reflection after Harry’s admission was touching and heart-warming, as was her determination to help him and her understanding of the issues. This part of the story was well done and perfectly timed. Interlaced within the romance is the mystery of what happened to the manor and Harry’s inheritance. It becomes apparent over time that Harry’s father was not the (sole) cause for the current financial situation. Christina enlists the aid of the manor’s ghosts to help her figure out who is behind the shenanigans, which makes her a target. As the story moves towards its climax, there is quite a bit of suspense, and I have to say my heart was racing. The plot line was exciting and well played. 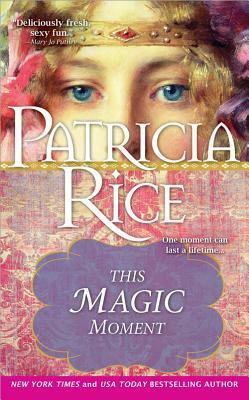 This Magic Moment is a wonderfully written, delightful tale. The phrase “happily ever after” befits this historical fairy tale about friends that had gone their separate ways only to find love amidst death, ghosts and poverty. I adore how both Christina and Harry each looks hard at their situation and identifies how they can be a better partner rather than set in his/her own ways. Their mutual joy and love is heart-warming. I really enjoyed this magical story. Wow, thank you! I do appreciate when a reviewer understands that an author has choices and likes the ones I’ve made. Bless you!